Wistons: Cllr Mike Jones told us that the ward councillors were impressed with how last month’s PCA-organised discussion in the Hall, about the anti-abortion pickets outside Wistons Clinic, kept on topic and didn’t turn into a debate about abortion itself. However the official response so far has been disappointing. Neither the police not the Council officials took up the idea of an exclusion zone, which would permit protest but stop picketing at the gate, possibly because Wistons don’t seem keen to initiate such a move. Recycling: Last week letters went out to Prestonville homes south of Old Shoreham Road inviting comments on a proposal to end kerbside recycling collections and instal communal bins like – but not in the same places as – the existing refuse bins. It seems likely that the scheme will subsequently be extended to the rest of Prestonville. We’ll be writing to the Council to express our concerns: please get in touch with your comments so we can feed them into our message. More on this soon but meanwhile the plans are outlined on the Council site. As you may know, the proposal for the Anston House development did not go before the council’s Planning Committee earlier this month because of doubts our campaign raised around the accuracy of the developer’s shadowing report which appears to have underestimated the amount of shadow cast on the Preston Park Rotunda and Rose Garden. This has given us the chance to spread the word wider about this campaign. We’ve set up a petition at brightondeservesbetter.co.uk. Please sign it if you think, as we do, that this building is more about providing a profit for developers Investec than providing sustainable housing for local needs. There’s also a Facebook page. The proposal will almost certainly go to committee now on 24 April. Again, it would be good to have people there. Please get in touch if you can be there, or want to volunteer to help this campaign. The next PCA committee meeting will be at 7pm on Tuesday 26 March. We’ll be discussing all the local campaigns and protests from Seven Dials to the BHASVIC field and Anston House. As always, all in the Prestonville community are welcome. Please let us know via info[at]prestonville.org.uk if you’d like to come along. You can read the agenda here: PCA Agenda 260312. So how did Seven Dials and city politics suddenly start revolving round a single tree? Looking back over the past few months and the past week’s excitement, I think I can see how we got here. During the consultation process, what caught many people’s eyes was the proposal to block road access from Vernon Terrace. It became a focus for objections, and in due course was dropped. At the same time, the scheme as a whole provoked furious opposition from a group of people living to the north-west of the Dials who objected to every aspect of it they could think of, and launched a campaign based on their fear that the scheme would increase traffic in their streets. With all this going on, nobody was paying the tree much attention. Although a number of meetings took place during the consultation, it was essentially a one-round process. The planners revised the scheme in the light of public responses, but not in the light of responses to the revision. The proposed felling of the elm was announced at the meeting in St Luke’s Church at which the planners presented their response to the consultation feedback. One man did bellow that he wouldn’t stand idly by while a magnificent English elm was cut down, but by that stage there had been a lot of bellowing, jeering and abuse in response to one aspect of the scheme after another. The elm still didn’t stand out. Things went quiet after that – until the schedule of works was published. It pushed the elm right out in front, the felling timetabled as the preliminary to the road works. If the council had started by digging up the road, the works would have been the natural target for the objectors’ complaints. Instead, the schedule presented them with the tree as a focus for their resentments. The demonstrations were only called a few days before the advertised felling date, and for several days were a protest against it – a ‘vigil’ to mark the tree’s death – rather than a campaign to save the tree. By delaying, possibly as a tactic to avoid confrontation, the council gave the protest time to snowball into the ‘Save Our Tree’ campaign. Then late on Wednesday afternoon, Caroline Lucas turned up and, in the nicest possible way, pulled the rug out from under the feet of her fellow Green Jason Kitcat, local councillor and Council leader, with her call to suspend the felling for further consultation. A few hours later, Tom Druitt (who had apparently been planning his action for some time before the ground-level protests) and Stephen Hendry went up the tree. There, at the time of writing, they remain, in an uncomfortable position, but not half as uncomfortable a position as the one they and Caroline Lucas have put the council in. Tree protester Tom. Or possibly Stephen. Two activists climbed the Vernon Terrace elm last night and are now perched in a net high above the Dials. I’m told one of them, Tom, is a veteran of the protests over near Hastings, where he spent six weeks up a tree. The council won’t be able to let that happen in the middle of the city, and word at the base of the tree is that the authorities may be considering a rethink. One of our councillors, Amy Kennedy, is on the transport committee. We’re emailing her to underline that the PCA would like the elm to stay. If you feel the same way, let our representatives know right away. 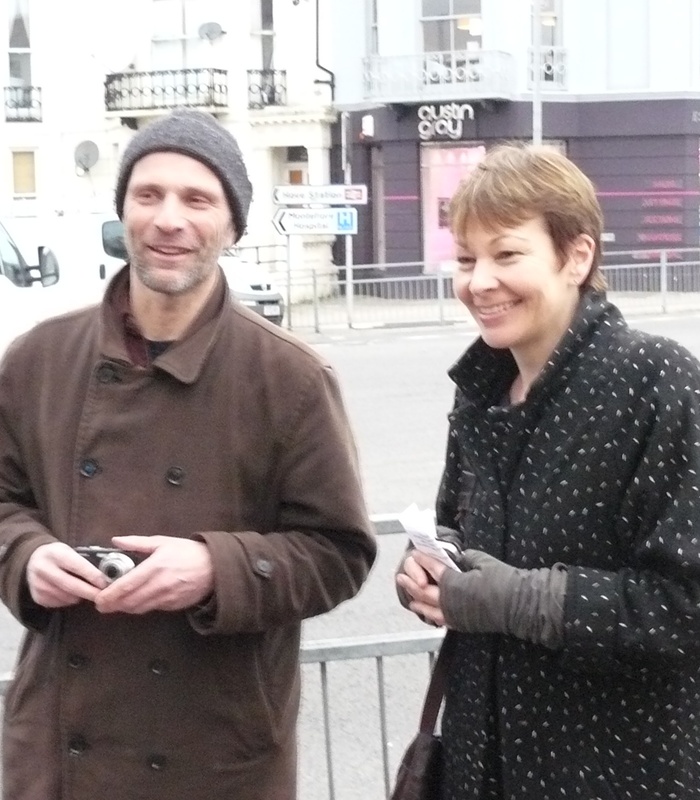 Caroline Lucas MP has stepped in to call for a stay of execution for the Vernon Terrace elm, which is scheduled to be felled this week as part of the Seven Dials improvement scheme. Visiting the site late this afternoon, she expressed her concern that the decision to remove the tree had not been properly discussed. Her intervention comes as what began a few days ago as a ‘vigil’ to mark the tree’s removal has turned into a ‘Save the Elm’ protest. With council leader Jason Kitcat insisting to the protesters that the tree has to come down, it looks like the city’s two leading Green politicians have a difference of view to resolve.